Have you ever thought about how life seemed so much faster as a child – and now you just have no idea where the time goes? For instance, I remember sitting down to watch Sesame Street as a kid, which was an hour long show – and half way through I would ask my Mom, “How much longer?” It literally seemed like that show went on FOREVER. Now don’t get me wrong, I liked Sesame Street and all, but an hour was SUCH a long time. Now I sit down and watch 3 hours of television at once and feel like no time went by at all. Also, car rides – it took on average probably 45 minutes to drive to my grandparent’s house, and each time it felt like an eternity that would never end, even though I had fun and exciting things to do in the car, like Gameboy and some books (yes, the old grey brick of a Gameboy! Woo!). But now my daily commute to work is longer than 45 minutes and it just trucks on by (except on the days with bad traffic – let’s be honest). Sometimes I get to work and barely remember driving at all – I was just lost in thought. But those 45 minutes were torturous as a child. So why does this happen? I think we have all experienced the phenomenon as we get older, where time just seems to zip on by. Where did last month go? How is it the end of the week already? And then there’s the significance factor. Things that happen in your childhood can often seem so much more significant than the same things in your adulthood. They can often have a bigger impact, psychologically – and this is often why counselling will spend time revisiting past memories and events, due to their impact at the time of building the overall picture of you. This is the Pie Chart of Life. There’s a little bit of math to help explain it – so bear with me. Okay. So let’s say you are 5 years old. You feel pretty old – you’re the oldest you’ve ever been! You’re now way older than those 4 year olds – they’re just babies compared to you. But then a few years later, you are 10. You are now TWICE as old as you were before. You have doubled your life span! And then, as time marches on, you are now 20. Again, you have doubled your life span! But now it takes until 40 to double it again. And then until 80. The doubling time takes exponentially longer at each new milestone. So what does this do to your psyche? As you gather years, the youngest years of your life get recorded with far more importance – there is not a whole lot written in the history of your life yet. You start with your blank slate of life, your tabula rasa, and you start recording your life’s story. Each event has major significance at this point, because your personal narrative is fresh. Time seems to go by much more slowly because your brain doesn’t get bogged down in thinking about your history, memories, and other fun but often useless facts that we dwell on. You are simply WRITING your life, so you brain is ready for new stuff ALL THE TIME. Then as you get older, your brain sees things differently. It has a lot of history that has been written, a lot of memories, ideas, and facts to play around with, and time now has new meaning. Time really does have the feeling of going by faster, because your brain thinks differently, and you actually experience time differently. I must give huge credit to my sister, Suzanne Miller, for helping me make sense of this theory. She had this image of a pie chart that just helped to bring it all together. To be able to put an image to the idea that we all experience certainly can make it easier to understand. This theory can also help us better understand ourselves as children, and help us make sense of what the heck our brains are doing as adults. It explains why we experience time differently at different ages, why time truly seems to go by faster the older you get, and why memories can feel more significant when you are younger. It can also help us to understand the science behind why childhood experiences truly can have so much power in developing who we are and who we become – and remind us of the value and significance of how we treat our younger generation. It can help us remember the impact that sometimes the smallest things can have on us as children, and to think about how this frames our understanding of children’s attention spans and what we expect of them. To expect children to be able to concentrate like adults for lengthy periods of time really does seem unreasonable when you frame it with this theory. We need to pay attention to how we treat the younger generation and to what we expect them to do. When we think about how kids “should be” with our adult brains, we often forget the real differences in how we perceive and place value on time as a child. It only makes sense – once you think about it this way. And while we’re at it – make sure that you forgive yourself if you are harbouring a negative narrative about yourself that you “weren’t good enough” as a child because you couldn’t do some of these things you were “supposed” to be able to do – like concentrate for long periods of time. An adult who didn’t understand this theory may have told you this about yourself, and you probably believed them as a child. Children believe what adults say to them. And make sure you forgive yourself if you are still holding on to memories that you should have “gotten over” by now from your childhood. They are written in your life’s history with much more significance than they might be written if you experienced the same situations as an adult, so they can feel a lot more intense. 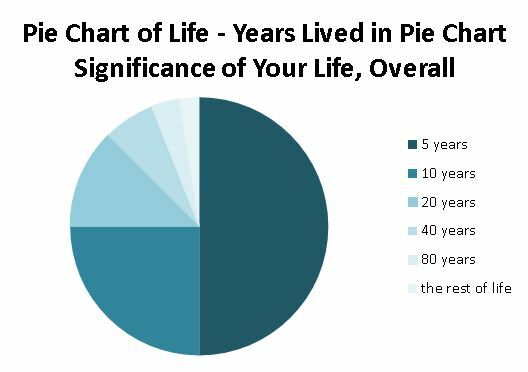 When you understand your past, and how your brain places significance on childhood memories with this Pie Chart Theory, you can better move forward toward your future - understanding and accepting yourself as a whole.